We were born June 3rd of 2018, on the rooftop of a “leftist” shop called Kinoki in San Cristobal de las Casas, Chiapas, Mexico. Our initial meeting was inspired by the struggles that the working class were fighting throughout the world. However, we were especially awed by the statewide teachers’ strikes occurring in the United States this past year, and the revolutionary uprisings which the CNTE (National Organizers of Education Workers), a radical union of Mexican teachers, initiated— such as the 6 month long 2006 Oaxaca Commune in response to police repression of the union’s yearly occupation of the city’s main square, and the caucus’s blockades of major roads and airports in retaliation to their demands being unfulfilled. With the rising worldwide movement of education workers, we sought to bring this struggle into the south Puget Sound region. Because the bureaucrats in the education business unions have consistently undermined worker militancy and solidarity by negotiating with the capitalists without the consent of the rank and file, we decided to form a revolutionary alternative to these craft unions. As we were packed inside a van leaving a Zapatista municipal center known as Morelia, our first version of the union’s points of unity were formed. This version emphasized our desire to organize education industrially rather than by craft, and to have schools be run democratically by the people who attend and work in them (students, faculty, and staff). The months of September and October were a long grind: revising the union’s points of unity, forming our own preamble and deciding how we would gain power. 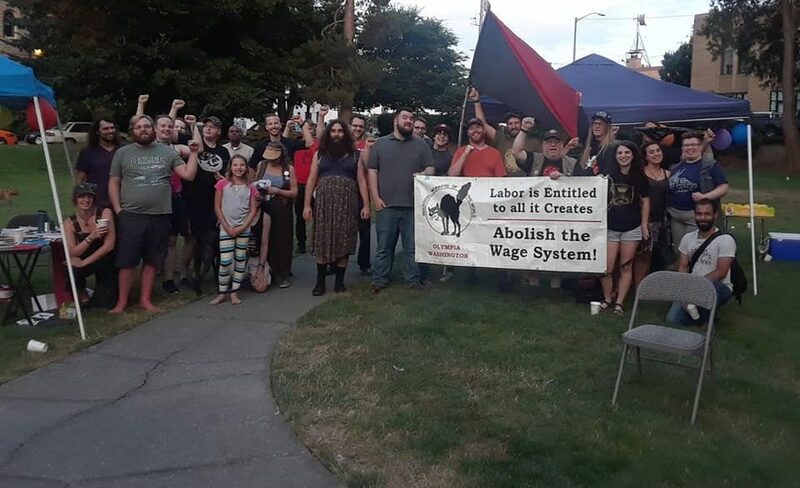 We slowly acquired a consistent membership and we gained a consistent core once we, the IWW South Sound General Education Union, decided on our first campaign. This campaign demanded that the Evergreen State College not hire another cop, and instead fund two full time teaching positions; one in political economy and one in the arts (either theater or photography). These demands were formed as a result of the college laying off over 20 positions during the summer of 2018, primarily in the art departments. As well, a political economy faculty member was not hired that summer, despite the fact that the department was labeled “top priority” for hiring. As of this writing, the school seeks to hire another cop, using the excuse of “mandated budget allocation” to not concede to our demands. Many students were angry about the layoffs as well, with some of them organizing large petitions to prevent the layoffs; yet, the administration ultimately ignored them. 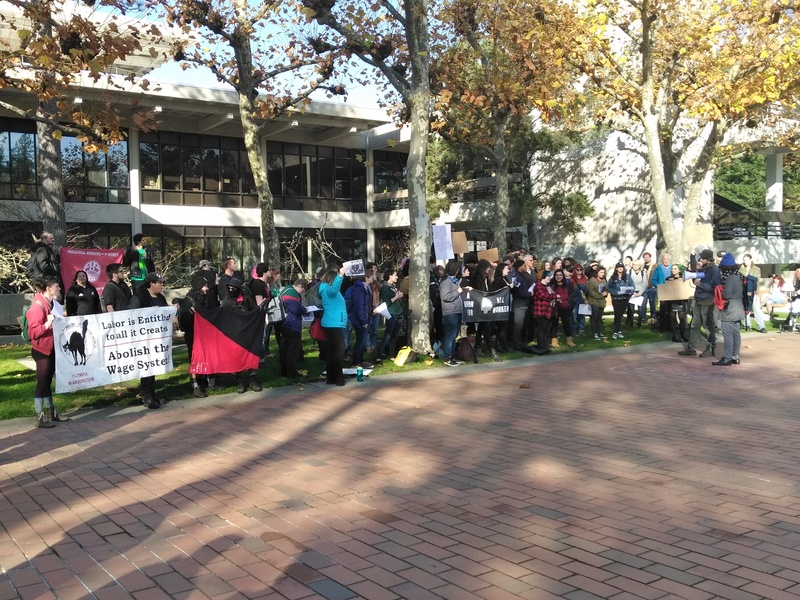 To debut our union and campaign, we conducted a rally on the central square of the Evergreen State College. Over 100 people showed up, making it the largest protest that happened on campus since the 2017 Spring uprising. We also marched into the office of the president and provost to read our demands, handing over the demand letter. We dispersed after the demand delivery. As of this writing, the administration has responded by portraying us as “illegitimate”. They wish to co-opt the union into avenues they can more easily control such as the faculty union and the student union, which is really more like a student government organization and does not have co-governance. The South Sound General Education Union will keep fighting! If you work in the education industry, whether K-12 or higher ed, whether as a teacher, student, or a cook, get in touch with us and get organized!